Aghamohammadi, S. (2018). Narumi-Katayama Polynomial of Some Nano Structures. 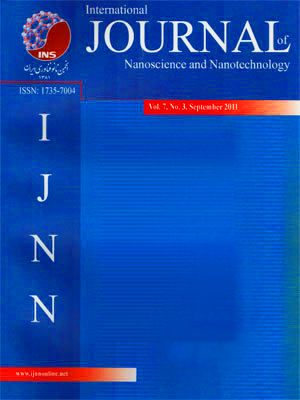 International Journal of Nanoscience and Nanotechnology, 14(1), 1-10. S. Z. Aghamohammadi. "Narumi-Katayama Polynomial of Some Nano Structures". International Journal of Nanoscience and Nanotechnology, 14, 1, 2018, 1-10. Aghamohammadi, S. (2018). 'Narumi-Katayama Polynomial of Some Nano Structures', International Journal of Nanoscience and Nanotechnology, 14(1), pp. 1-10. Aghamohammadi, S. Narumi-Katayama Polynomial of Some Nano Structures. International Journal of Nanoscience and Nanotechnology, 2018; 14(1): 1-10. Department of Mathematics, Islamshahr Branch, Islamic Azad University, Islamshahr, I.R. Iran. The Narumi-Katayama index is the first topological index defined by the product of some graph theoretical quantities. Let G be a simple graph. Narumi-Katayama index of G is defined as the product of the degrees of the vertices of G. In this paper, we define the Narumi-Katayama polynomial of G. Next, we investigate some properties of this polynomial for graphs and then, we obtain this polynomial for some composite graphs such as splice, link, join, composition and Cartesian product of two graphs. Finally, using our results, we compute this polynomial for some nanostructures such as dendrimers and the chain of fullerenes.